Saltaire, a World Heritage Site, is a Victorian model village by the River Aire and the Leeds and Liverpool Canal in Bradford. 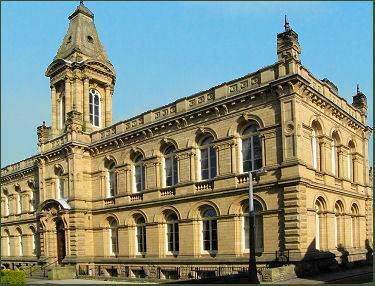 Saltaire was constructed in 1851 by Sir Titus Salt, a leading industrialist in the Yorkshire woollen industry and designed by the architects Henry Lockwood and Richard Mawson. The village's name is a combination of the founder's surname and the River Aire. Salt moved his business from Bradford to the site near Shipley to arrange his workers and to site his large textile mill by the Leeds and Liverpool Canal and the railway. UNESCO designated the vilage a World Heritage Site by UNESCO in December 2001. The village has survived remarkably complete, Salt's Mill closed in February 1996, the building now houses a David Hockney gallery and a selection of shops, restaurants and cafes. Another noteable building in the village is the United Reformed Church, a Grade I listed building, known as 'a Cathedral of Congregationalism' which is a fine example of Victorian Italianite architecture. The nave has no aisle and on the western end has a semi-circular portico. The portico is topped by a round tower with a clock at each quarter and above that an octagonal array of Corinthian columns with a dome. The columns are decorated with Scagliola, an Italian technique implemented by Mr. Dolan of Manchester. Two ornate chandeliers of ormolu and cut glass hang from the ceiling, of such great weight that additional roof trusses were required to support them. 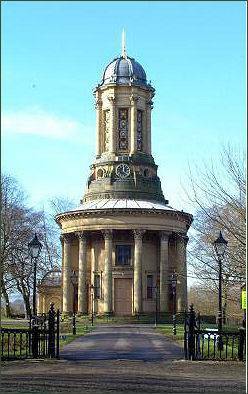 Victoria Hall, originally known as the Saltaire Institute, is used for meetings and concerts, and houses a Wurlitzer theatre pipe organ.